It was year 1993, could significantly be said as the year I started cooking on my own. Parents used to host lot of parties and it was always me who did all the setting and ad hoc things. Amma was the chief chef and me her assistant. Amma used to spellbound our guest with the items she used to dish up and I used to get appreciated just for the simple reason that I was her daughter. I used to wonder if I will ever be able to dish up so many items if I ever try. But that was a time when I had not even started cooking on my own. Then came the Kanna Kazana. And world changed. I guess for many that was the period that drastically changed one's attitude towards cooking. Sanjeev Kapoor used to make everything sound so simple. And we were hooked to the TV. Everything he showed were repeated at home and much to the joy of all, they used to taste heaven. I used to amuse myself with Soufflés, Mousses or Cakes. Simple dals were way beneath me!. I used have my nose tipped at the sky each time somebody appreciated my cooking skills and used to think that regular cooking would be a cake walk. Then it happened one fine Sunday morning. Sunday Mornings are always Poori mornings at home, even now too. The side dishes that Amma used to make varies from Chenna to Potatoes or the simple Moong Dal. That morning it so happened that we didn't soak chenna or had potatoes at hand. So I thought making Pesarapappu or Yellow Moong Dal for Poori would be a breeze. Little did I know then what a trepidation it would be. Even that simple dal proved to be the testing task for me. I thought what a big deal, just put everything in cooker put it on for some whistle and then tamper it...boy was I wrong! After my ordeal with this simplest one, I realized the dal should not be over cooked, should not add all onions nor should I add tamarind. What else goes into this? smallest measure of onions, with just one tomatoes and the tadka...great. Never did I realize I would get such a bowing to what cooking was. That was a humbling experience. After that incident, my recreations of this dish has come out with flying colours. But I have never forgotten that learning experience. 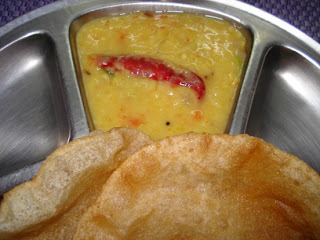 My liking to this dal has increased now more because my daughter eats this without much complaint. So here is dish for a lazy sunday bunch. Clean Moong dal and in a pressure cooker, add chopped tomatoes and half of onions along with turmeric and slit green chillies. Put it for 1 whistles. You can even switch off when the whistle is about to go. This way the dal retains its shape else it will be overcooked. In a pan, heat 1 tsp of oil, add finely chopped garlic, then Cumin seeds. Once it starts sputtering, add onions, curry leaves and red chillies. Sauté for 2 mins till the onions are brown, then add to the dal. Add more water if required, adjust salt and garnish with coriander leaves. This goes excellently with Pooris. 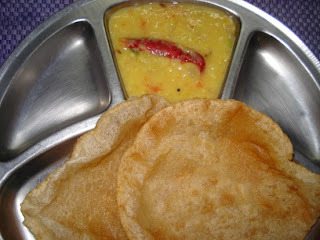 On the subject of favorite breakfast, mine is all breakfast items...:)..dosa tops the list of course maybe next to Pooris. But anything tiffen is to my likings. Infact wanted to have series on Dosa varieties. Will be coming out with that!